Photo courtesy of patruby83, some rights reserved. Summer is here, and with it, our thoughts turn to clean, clear, crisp and refreshing drinks that can be savoured during those long evenings, where the sunlight lingers on the lawn, and the birds stay up late gossiping in the trees. What place then for the #midweekmanhattan, a surly, autumnal, rich, spiced concoction that is surely best enjoyed from a leather armchair in front of a crackling log fire? Well, my friends. The Manhattan has another life. Briefly alluded to in passing (see The Affinity), the manhattan can also be enjoyed as a sharp aromatic drink, the Dry Manhattan. 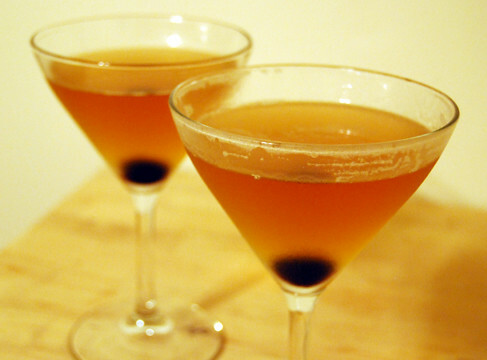 The Dry Manhattan owes much of its popularity to its association with Frank Sinatra and the Rat Pack (although more of that another time), and can be spruced up for summer drinking with the addition of some quintessential floral summer notes; primarily elderflower. Elderflower has a long association with the British summer, and elderflower cordial, made from sugar, water and elderberry flowers, is a staple of Famous Five style traditional picnics. For those who look for a little more bite to accompany their cucumber sandwiches, however, a range of elderflower liqueurs can now be employed to bring that summer picnic twist to the Manhattan. Add a large measure of whiskey, a measure of elderflower liqueur, half a measure of dry vermouth and two splooshes of bitters (dandelion & burdock would work well) to a shaker of ice. P.S. I am keen to try this with green tea vermouth, but worry that the extra floral notes might begin to dominate the whiskey in an uncompromising manner. Tea is every Englishman’s drink of choice, so what better way to delve deeper into the world of cocktail experimentation than by adding tea to some classic recipes? A number of sources I’ve consulted have suggested tea-infused sugar syrup or tea infused bourbon, but inspired by some recent reading, I’ve decided to prepare some tea-infused vermouth – a staple of a number of the old favourites already featured on this site. On recommendation I’ve opted for a green tea infused dry vermouth and a chai infused sweet vermouth. The former to provide a healthy jasmine tint to the classic Martini, and the latter to spice up (quite literally) my Manhattans and Whiskey Sours. The tea I’ve used has come from Jeeves & Jericho, a pair of upstarts from Oxford, who front a jolly good tea company and have been powering this site during daylight hours thanks to their delicious Scottish Brew. Infusing any liquid with herbs, spices or tea leaves is a fairly simple process and is best worked at over time using a trial and error approach. With that in mind I’ve opted for two slightly different recipes. Add one tablespoon of loose leaf green tea to 500ml of dry vermouth. Leave to infuse for twenty-four hours. Sieve and store in an air-tight bottle. 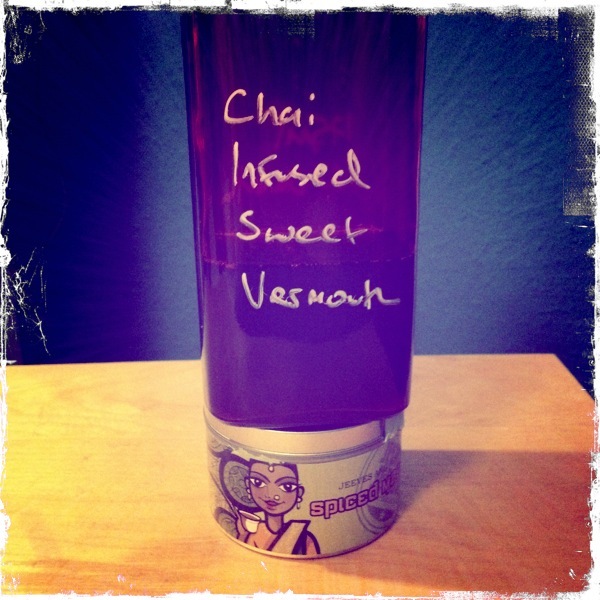 Add six tablespoons of loose leaf Chai tea to 200ml of sweet vermouth. Leave to infuse for thirty minutes. Add a large measure of whiskey, a measure of chai vermouth and three splooshes of your preferred bitters (I used Boker’s) to a mixing glass. Stir well and strain into a Martini glass. Garnish with a cinnamon stick or a twist of lemon. Add one part green tea vermouth, five parts gin and three splooshes of a fruity bitters (I used dandelion & burdock). Stir and strain into a Martini glass. Garnish with a twist of grapefruit or lemon. Delicious and refreshing, both; just like the tea that inspired them.